First, let me wish you a happy new year. Hope 2013 is a blast! 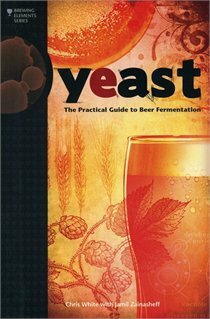 The next book in my book review series is Yeast: The Practical Guide to Beer Fermentationlink, by Jamil Zainasheff & Chris White of White Labs fame. This is not your typical homebrewing book; indeed, it is an almost-textbook about choosing, using, managing and culturing yeast. The beginning part of this book is a must read for all brewers. It covers the basics of yeast biochemistry, the chemistry and conditions that lead to various flavour and off-flavour compounds, how to manage yeast in a fermentation to produce the desired flavour profile, and how to get the most out of your yeast. This section alone is reason enough to buy this book. Unfortunately, after a strong start this book weakens. Much of this is due to to attempt by the authors to cover both homebrewing and commercial beer production. This has detrimental effects – for example, in the section on stepping up yeast to pitchble amounts specific guidelines are not provided and instead we are given some general rules plus some equations to work things out for your own brewery – a situation fine for commercial operations with a yeast-lab, but out-of-reach for most homebrewers. This situation persists for much of the remainder of the book – commercial and homebrewing advice & methods mixed together in a way which is difficult to understand & use in the context of homebrewing. The book finishes off with a series of lab-based protocols for analyzing yeast for contaminants & yeast characteristics. While interesting, these too are methods beyond the capabilities of most homebrewers. Despite those flaws, in my opinion this is a book that belongs on the shelves of all serious homebrewers.